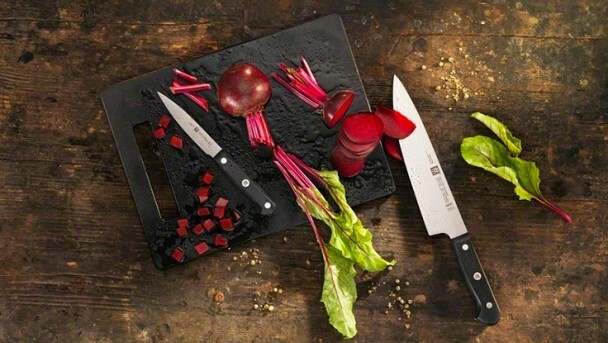 ZWILLING® Gourmet is the go-to knife for home chefs eager for their everyday knife to be exceptional. The single-piece, precision-stamped blade construction is lighter than forged knives, allowing for maximum maneuverability. FRIODUR® ice-hardened blade for extra long cutting edge and corrosion resistance. Ergonomic handle in three-rivet plastic for fatigue-free and safe working. Laser printed ZWILLING logo on the central rivet.